Getting world leaders to recognize the incremental effects of global warming has challenged environmental leaders for decades, but Frank Huber doesn’t have to look far to see evidence that his climate, at least, is changing. The chief architect of Zugspitze’s ski slopes, Huber has worked with a steadily shrinking glacier and an ever-decreasing amount of snow year for decades, and to him, the trend is unmistakable. But that doesn’t mean giving up. 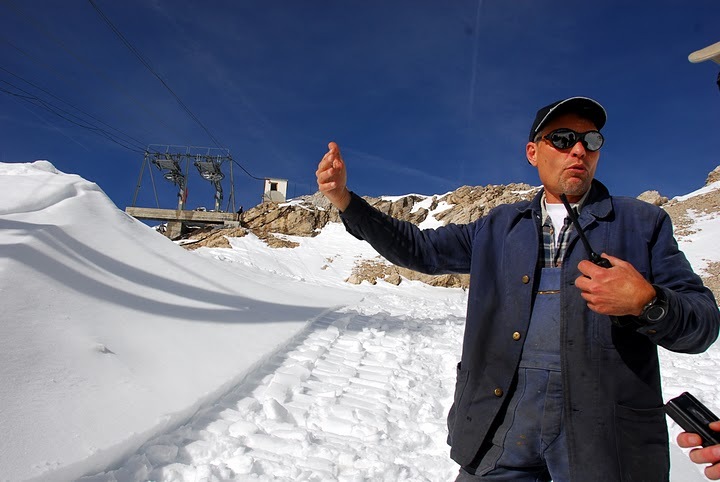 Every summer, Huber and his workers cover some 12,000 square meters of Zugspitze’s glacier with protective tarps which reflect the sun’s heat, thereby slowing the glacier’s recession. Similarly, Germany is acting to combat climate change and adapting to its effects. Passing an energy tax to finance the production of solar energy facilities and approving a cap-and-trade system of reducing factory emissions, the nation has taken steps towards reducing its carbon footprint that other G-8 nations like the United States have so far refused to match. “Maybe this shows a little bit of the German character. 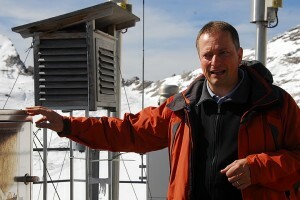 We are trying to do something,” said Dr. Ludwig Ries of the Federal Environment Agency, who supervises an atmospheric study facility near Zugspitze’s summit. Like other monitoring stations around the world, the mountainside base has measured carbon dioxide levels increasing at a rate scientists consider dangerous to the global climate. More efficient power plants and buildings, increased investment in renewable energy sources such as wind, and calculating automobile taxes based on carbon dioxide emissions were among Germany’s additional measures passed in 2007, with more slated to follow in 2008. “I think that the effectiveness in German policy lies in the combination of these different measures,” said Enrico Brandt of the German Embassy in Washington, DC. The investment isn’t cheap: 3.3 billion Euros (about $4.8 billion) in 2008 alone. There are indirect costs as well; for example, Germans have paid through higher beer prices as farmers turn away from barley in favor of corn to make ethanol. The price for an Oktoberfest liter climbed above $10 last year. But the results are encouraging: through 2006, Germany’s greenhouse gas emissions fell 18 percent from the base year of 1990. While Chancellor Angela Merkel has delivered on her pledge to address the issue, persuading other nations to warm up to the fight is another challenge entirely. In particular, the German leader has tried to sway the United States. The world’s largest emitter of carbon dioxide disappointed environmentalists by failing to ratify the 1997 Kyoto global warming treaty, citing its economic cost. At the 2007 G8 summit in Germany, President George W. Bush joined national leaders in a resolution acknowledging the problem and pledging to attempt a 50 percent carbon dioxide emissions reduction by 2050. The president’s step did not satisfy American critics such as Al Gore, the former vice president and Nobel Prize winner who’s accused the White House of “dilly-dallying” on global warming and even censoring scientific reports on the subject. Similarly, some German critics are so frustrated with the White House that they are already counting the days until a new administration occupies it. However, the State Department maintains that the two nations largely agree on climate change, and they are actually moving closer together in their positions on the issue. While some have faulted the US government for relying on voluntary action rather than binding measures to limit emissions, Tessler cited the 2007 energy bill that Congress passed and Bush signed, requiring an average automobile fuel efficiency of 35 miles per gallon by 2020. “That’s a binding target in the transportation sector, an area where we are taking the lead,” he said. Germany and the United States joined some 180 nations at the United Nations climate change conference in Bali last December, where delegates agreed on a framework to negotiate emissions reductions over the next two years. “The most significant success of the Bali Roadmap is that, for the first time, we in the developed world have brought the developing world into a framework for negotiating ongoing greenhouse gas reductions. That’s very, very important,” said Tessler. “We can’t do it alone, and we shouldn’t do it alone.” Developing nations include China and India, home of rapidly growing economies and skyrocketing air pollution figures. To Germany, “Bali went not so far as we had hoped, but farther than we expected,” said Brandt. The nation had wanted an agreement on more decisive international measures to actually begin the hard work of reducing emissions, but even without such a deal, Germany intends to continue its effort within the European Union and with strategic partners including American states. For example, German Foreign Minister Frank-Walter Steinmeier traveled to California last year to meet Gov. Arnold Schwarzenegger, the Austrian-born and German-speaking leader who’s championed environmental causes during his five years in office. Under Schwarzenegger, California became the first state to cap greenhouse gas emissions, and sued the federal Environmental Protection Agency for blocking the effort. “Where climate protection and a sustainable energy policy is concerned, we agree almost seamlessly,” said Steinmeier, while Schwarzenegger praised Germany for its “great leadership when it comes to protecting the environment.” The two agreed to pursue a plan to link cap-and-trade emissions systems. If the world’s leading scientists are right, many such steps will be needed to ward off the most ominous consequences of global warming. In a definitive 2007 report years in the making, hundreds of scientists from the Intergovernmental Panel on Climate Change concluded that burning of fossil fuels could cause a worldwide average temperature increase of 11 degrees Fahrenheit by 2100. If unchecked, they warned, the effect could lead to famines, hurricanes, proliferation of diseases, droughts affecting up to 2 billion people, and extinction for up to 30 percent of the world’s species. The master of the mountain’s ski slopes knows that. Covering the glacier buys time, but every fall when Huber and his crew pull up their tarps, they find less snow to accommodate winter skiers than the year before. Where there was once 3 million square meters of ice coverage, now there is less than 500,000. Zugspitze, beautiful and picturesque, holds a special place in the hearts of Germans, but Huber believes it’s only a matter of time before the nation’s highest ski lifts shut down forever.